One of the cool things about craft production is that it does not respond to markets so much as do away with them altogether- supply and demand are localized in both space and time. When in the service of self-sufficiency, production is not only localized but scaled in response to some form of human power. Taken to the extreme, making anything begins with tools making tools, with the added requirement of self-replicability. 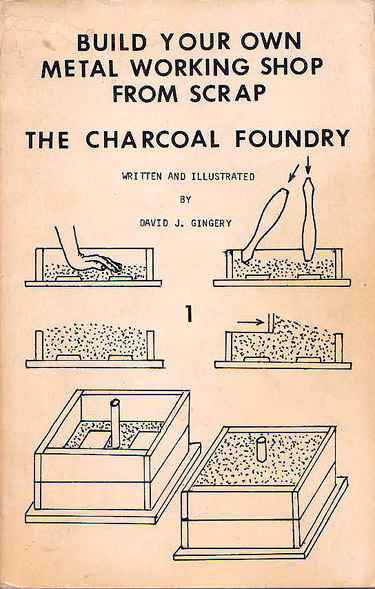 I have a small library of books on self-sufficient living and have been studying Build Your Own Shop From Scrap: The Charcoal Foundry (self published, Springfield, MO, 1980), written and illustrated by David J. Gingery. The book is folksy but practical and highly instructive, and has me seriously considering building a foundry and making my own woodworking tools. I’m particularly drawn to the 19th century foundry model described by the author, epitomized by the long defunct Maramec Ironworks of St. James Missouri. Like all pre-industrial foundries, the Ironworks smelted their own locally mined ore with charcoal from local timber, and powered their leather bellows with a water wheel. “The more than 20 years of research and experimentation that precedes this group of manuals was inspired by a statement by someone I’ve long forgotten: ‘The metal lathe is the only machine in the shop that can duplicate itself or any other machine in the shop.’ It followed then: If you have a lathe you can produce the rest of the needed equipment to make up a fully equipped machine shop. Of course my first problem was that I didn’t have the lathe. As is usually the case with the hobbyist, experimenter or inventor, I didn’t need a machine shop, I just wanted one. There was no way to justify the cost of the commercially made equipment so I set out to build my own. Posted by Scott on April 8th, 2009, at 12:41 pm, and filed under all, maintenance, material provenance.